We are getting excited about Christmas at Cotley Farm. 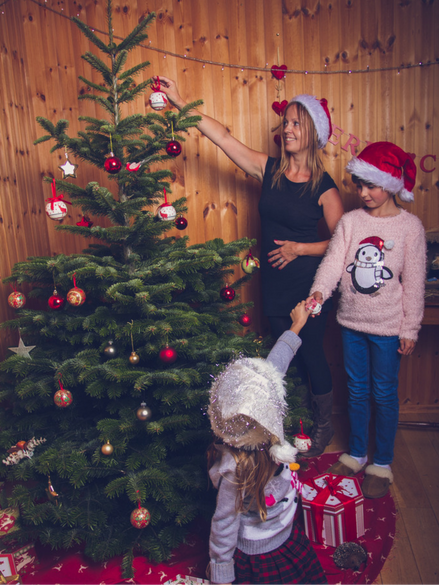 We can't wait to open on 26th November and start spreading some Christmas joy with our Reindeer, new Christmas Shop and of course trees! At Cotley we are very proud of our Christmas trees, growing them to a high specification so that our customers go home with their perfect tree. Our trees are freshly cut so should last well over the festive season. However, to help you be ready to deck the halls and of course our trees, we've put together some all-important do's and don'ts to remember when looking after your Christmas tree. • If you aren't decorating your tree straight away, do keep it in a sheltered, unheated area and place the tree in a bucket of water. • Before putting it in the stand, do cut off a disc of wood, up to an inch thick, from the base of the trunk. • Do use a water holding stand that fits your tree. • Do inspect lights before placing them on the tree and try to use lights that produce low heat such as, miniature lights which reduce the drying of the tree. • Don't keep your tree near heat sources e.g. fireplaces and televisions as this is a hazard and will also cause the tree to dry out faster. If possible, avoid putting your tree in a space with a lot of direct sunlight as this can also affect the dryness levels. • Don't forget to keep the tree stand filled with water. This prevents the needles from drying out and dropping. As a general rule, the stand should provide 1 quart of water per inch of stem diameter. • Saying that, don't use hot water in the stand and don't use chemicals in the water as this causes the water to evaporate. The most important thing to remember is that your tree is just like a flower and will last much better if regularly watered every day. You'll be surprised how much it will drink!